The coverflow renders a dynamic coverflow carousel. 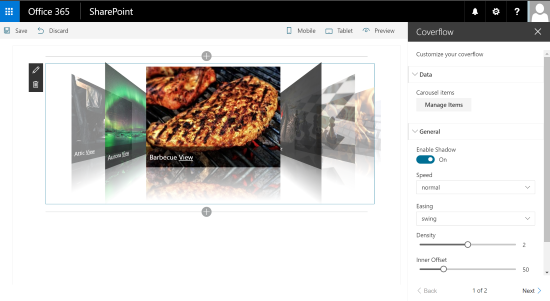 This web part uses the jquery.coverflow.js (a popular jQuery script) as a client side web part for SharePoint. This web part uses also the Custom Fields library to enhance the web part edition experience. duration: The speed of animation. Use one of the standard constants "slow", "normal", "fast"